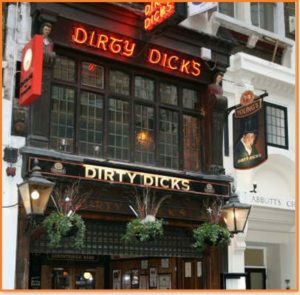 Dirty Dicks Pub in London which opened in 1745. Although it has been in business for so many years, it is not any ordinary pub. In fact, it has an interesting history behind it getting its present name. The pub was earlier known as the Old Jerusalem. Dirty Dicks pub has been named after its previous owner Nathaniel Bentley. He was a merchant by profession in the 18th century. Apart from that, he also owned a warehouse and hardware shop. Nathaniel Bentley was popular among the locals as dirty dicks as after the demise of fiancée on their wedding night he had sworn never to wash and clean for the rest of his life. The shops soon began to smell of the filth. Dirty Dicks is a three storied pub which is close to the Liverpool Street. The pub also hosts parties, has live bands playing music. There are also plays, karaoke parties and much more happenning at the pub. For a very long time, the pub still had the cob webs and dead cats which were there since the days of Nathaniel Bently as a part of its pub in order to maintain its original look. However, now these have been removed and the place has been given a make-over.